More from exhibits at the Contemporary Art Center in Virginia Beach featuring Germanna’s Art Department Chair, Sandra Luckett. The work “Positive Spin” is currently on display. Click on the image above for a live experience. Sen. Warner says expansion of Germanna's Fredericksburg Campus critical to area's economic future. 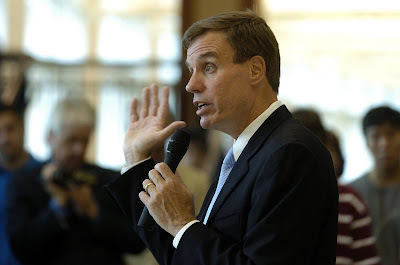 "In the past," Sen Mark Warner says, "there was the expectation that public education would be funded by public funds. Increasingly, that’s not the case." "... Community college, where so much is really done, particularly in terms of economic development, doesn’t have the kind of donor base universities do. [Capital] has to come from the business community." Sen. Warner says area businesses would be wise to help supply seed money necessary to break ground on a third building at Germanna's overcrowded Fredericksburg Campus in Spotsylvania. "Part of the challenge this community has got is not just attracting jobs—it’s attracting world-class jobs," he said. "This is a community that in its own right is world class. You don’t want it to be just the lower-income jobs that are actually coming. At the end of the day, you want to have that kind of world-class job." MOST PEOPLE think of physical illness when asked about the most common causes of death. But suicide, which is almost always the result of mental illness, is the 11th leading cause of death in the United States. Among young people between the ages 10 and 24 years of age, suicide is the second leading cause of death.